Without L.A. in play, NFL team owners would need to find a new bogeyman. Enter London. If the league plays its cards right, it can spend the next two decades dangling London as a threat to silence any U.S. stadium naysayers — while still using the distant promise of a team to plump up British interest in the NFL, in a kind of “watch us and we will come” strategy aimed at the 64 million bereft souls who have never known the joy of buying a $10 foam finger. The rest of the essay explains why I don’t think London is an alluring target for NFL owners, and includes all the digs at American football culture and links to comedy routines that you’ve come to expect from posts here, only I actually get paid for it. So go read it already! 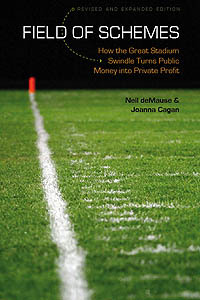 This entry was posted in London NFL team, recommended reading, Tottenham Hotspur by Neil deMause. Bookmark the permalink. London would be a logistical nightmare for the NFL players. A truce in your Washington Post war, Neil? Well it’s nice of you to mention me, I guess. Let us know when the Milwaukee Journal Sentinel asks you to do a column! Congrats on the article! Nicely done.